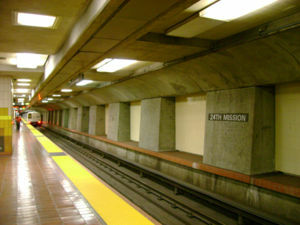 Station entrances are located on the northeast (Elevator access) and southwest corners of 24th St. and Mission St. Ticket machines are available at the underground station concourse. First time riders must purchase a reusable BART ticket or Clipper card from a vending machine before boarding. All riders must pass through the faregates with a valid ticket or card. Keep the ticket or card for the ride and use it to pass through the faregates again when exiting the station. This station features center platforms. Bicycle racks are available inside the paid area of the station concourse. This page was last edited on 19 November 2018, at 17:22.